In an effort to make quick and easy meals that can store easily since B had a lot of long nights this week, I decided to make a dish that I have previously made in the past, lentil soup, but I wanted to make something else with it. For the lentil soup, I did make a number of changes (both voluntary and involuntary). First, I decreased the amount of olive oil in the soup to 1 tbsp. Second, I increased the spices by 3x as much as was in the original recipe (since we doubled last time and it was still fairly flavorless). In terms of the involuntary adjustments, I forgot to add in the spinach and vinegar at the end. B said he preferred the first version better whereas I liked this one slightly more. Hopefully next time I’ll remember to add all the ingredients so we at least have a good judge for exactly where this recipe should be. To go with the lentil soup, I made a rub for the chicken and let it “marinate” in a Ziploc bag in the fridge. For my vegetarian chicken sandwich, I used the Morningstar Farms Chi’ken strips. I used the same rub for both the strips and for the real, defrosted chicken. I served the chicken in a pita like an open-face sandwich (which is how I ate it) or a soft taco (which is how B ate it). I’m very proud of the Tzatziki, I think it came out very well (especially for my first attempt at making it since B had been the one to make it in the past). Points values include Tzatziki sauce. With Chicken (with wheat pita): 10 Weight Watchers PointsPlus (13 Weight Watchers PointsPlus) – this estimated by guessing that the meal made 1-190g chicken breast, I’m not sure exactly how much it was since this was B’s meal and he doesn’t measure food since he’s not on WW. In a large Ziploc (or similar brand) bag, add all the ingredients and chicken. Shake well and make sure chicken is well coated. Put aside in refrigerator until ready to cook. When ready to cook, preheat oven to 350-400 degrees (for chicken) and have a glass dish inside getting warm. For both chicken and chi’ken strips, melt butter into a saute pan. Add chicken (or chi’ken strips) coated with herb rub into the pan to sear. Cook chicken about 2 minutes on either side until it has a golden brown color. Add chicken to oven in the glass dish and cook for an additional 15-20 minutes until chicken is cooked through. 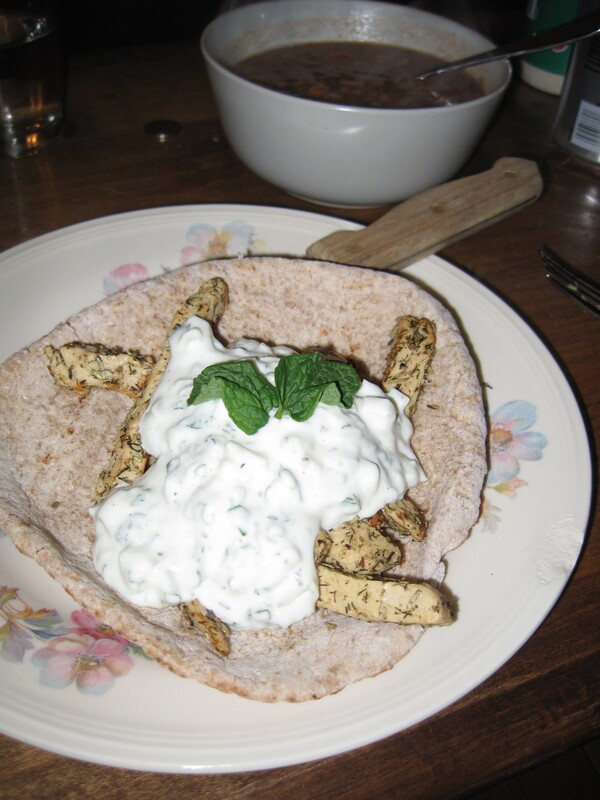 When ready to serve, add tzatziki over top of the chicken and pita. Garnish with mint. In a bowl, add olive oil, vinegar, garlic salt, garlic powder, and cucumber. Mix well until cucumber is well coated. Add mint and mix well into the cucumber mixture. Fold in greek yogurt. Let sit in refrigerator for 15-20 minutes before serving.